The watermelon is a fruity juicy drink packed with immune boosting vitamins which could use for a super Mocktail recipe. Find here how to make Watermelon Cilantro Crushed. 1. You can make Watermelon juice through your blender from watermelon fruit. 2. Now in a cup, add sugar and lemon juice and stir it well. You can add little water to dissolve the sugar. 3. 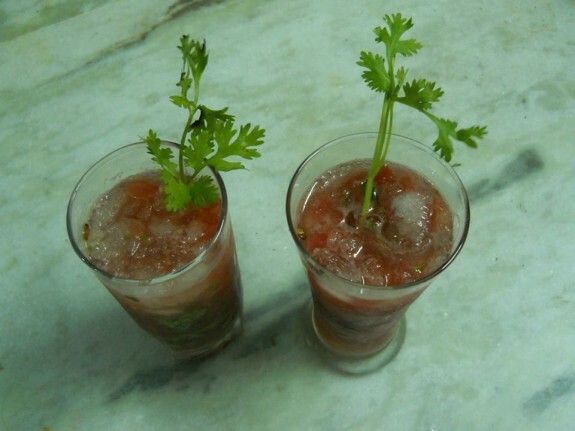 Now add coriander leaves on the watermelon juice long with the sugar lemon syrup. Stir it to combine everything and refrigerate it for 6-8 hours. 4. While serve, pour the chilled watermelon in a glass along with cold drinks (sprite, dew, 7 up) or club soda, crushed ice and slice of lemon. 5. Decorate it with Coriander leaves on top and serve it chill.